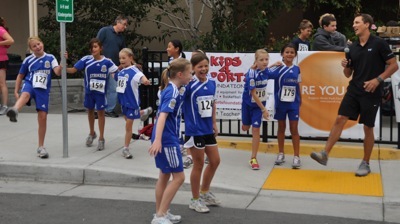 Showing a distance runner can master shorter races, Stanford grad Chris Mocko (number 64) went wire to wire to win the Kids 4 Sports run this morning in a time of 15.07. Categorizing his participation as a “kick off,” Chris said he hasn’t been doing much competitive running lately. 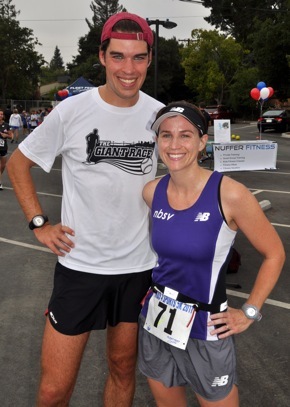 Crossing the finish line in a time of 21.23, the female winner was Menlo Park resident Amanda Packel (pictured with Chris). Amanda, who runs for New Balance Silicon Valley and is the mother of a nine-month-old baby, said this was just her second race since giving birth. “I started running as a little kid and never really stopped,” she said.